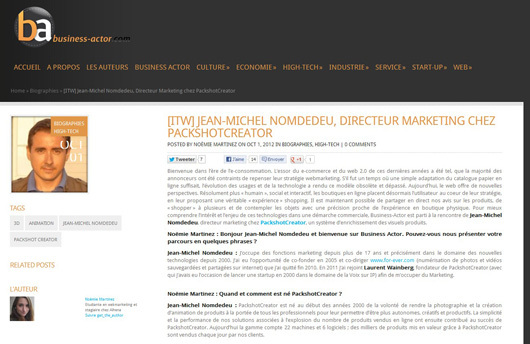 Business-Actor.com has interviewed Jean-Michel Nomdedeu, Marketing and Strategy Director at PackshotCreator about the challenges of web 2.0 in a business strategy. Welcome to the era of e-consumer. The rise of e-commerce and web 2.0 in recent years has been so that that the majority of advertisers have been forced to rethink their webmarketing strategy. If there was a time when a simple adaptation of the printed catalog to online was enough, the change in uses and technology has made this model obsolete and outdated. Today, the web offers new perspectives. Definitely more “human”, social and interactive online stores now place the user at the core of their strategy by offering a real shopping ‘experience’. It is now possible to share in live our opinions on the products, to shop and contemplate several objects with an accuracy close to the physical store experience. To better understand the importance and the challenge of these technologies in a commercial approach, Business-Actor went to meet Jean-Michel Nomdedeu, Marketing Director at PackshotCreator, a system made to enrich product pictures and animations. Hello Jean-Michel Nomdedeu and welcome to Business Actor. Can you describe your background in a few sentences? I have been in the marketing field for over 17 years and specifically in the new technologies sector since 2000. I had the opportunity to co-founding in 2005 and co-lead www.for-ever.com (a scanning photos and videos service stored and shared on the Internet) that I left in late 2010. In 2011 I joined Laurent Wainberg, founder of PackshotCreator (with whom I had the opportunity to launch a startup in 2000 in the field of Voice over IP) to take care of the Marketing there. When and how was born PackshotCreator? PackshotCreator was born in the early 2000s from the desire to make product photography and animation creation accessible to all professionals, to enable them to be more independent, creative and productive. The simplicity and performance of our solutions associated with the explosion of the number of products sold online finally contributed to the success of PackshotCreator. Today the range includes 22 machines and 6 software; thousands of products showcased by PackshotCreator are sold every day by our customers. In a few words, can you present to our readers your services? Our systems can generate in few clicks still photos, 360-degree animations and even real 3D animations (shoot on an additional axis). Our last innovation, the PackshotCreator X5 is able to take pictures like a robot: 1800 HD products picture are automatically converted in a 3D file and published on the website as bags for example. The customer only has to watch the show … And count the sales! Definitely turned towards the social and interactive, online stores today put the user experience at the core of their marketing strategy. Is it a main factor of success for you? Yes, because the poor quality of a photo, the lack of visual information and the frustration are important factors in web stress when buying online. The sanction is irrevocable and directly affects sales. Our recent study, which was conducted among European Internet users and customers, has helped identify key points concerning the use of enriched and interactive visual. For 80 of of them prefer 360° and 3D product animations before buying. the Internet users surveyed, the image quality (resolution, size, clarity, interactivity …) is a barrier to purchase..
For our customers who use PackshotCreator, 67 percent of them admit that they can differentiate themselves from their competitors and 63 percent of them observed with this an increase of their turnover. Your service tends to abolish the boundaries between physical and virtual commerce. How do you see the relationship between these two modes of shopping: rather competing or complementary? Aristide Boucicault, the inventor of multisensory marketing, had traced the way to guide us today. Our teams are working to make the purchase act on the Internet as rich as possible and render the experience more familiar, like if it was in a real stores. The ability to manipulate a virtual object as in a physical outlet can compensate the inability to touch the item before buying. But to do so, we need to be able to look at the product from all angles and zoom with precision on every detail to assess the quality of the product or the material. Our solutions specifically meet these needs so we can talk about true complementarity. Competition exists, rather on the same sales channel. Thus, on the web, in order to avoid high discount and protect their margins, brands and retailers need to win new customer, convince them and gain their loyalty. The premium image of a 3D animation contributes to the achievement of these three objectives. Who are your customers and what are their feedbacks concerning the PackshotCreator experience (evolution of the transformation rate, time of product consultation, …) ? The high-quality pictures and interactive products animations imposed themselves as a standard to promote or sell products on the internet. Necessarily all professionals need solutions adapteded to their constraints (skills, budget, productivity, ROI). Our clients are both large groups and SMEs. For nearly 10 years their experience has allowed us to improve and develop our solutions. Does the service tend to evolve with, for example, the key new features (augmented reality, etc.)? What future do you see for PackshotCreator? 3D view on 3 axis (above, below and all around the product) is now the most advanced and effective way to show a realistic commercial product photos on the internet (great rendering of texture, colors under all angles… with a HD photo). PackshotCreator was the first to offer solutions to businesses to create such visuals. We are now working on handling technologies that use PCs or mobile cameras, audio or video rendering and of course augmented reality. Today each company has a fax, maybe tomorrow we will all have access to our 3D enriched scanning office tool! Finally, where can our readers find you for more information? Our website www.packshot-creator.com, to discover all our ranges and especially to see examples of pictures and 3D animations that can be manipulated. We are also present on many shows, including the next VAD e-commerce in Lille from 23 to 25 October. In addition, we invite all those who wish to discover and test our solutions with their own products in our showroom in Paris’s 17th arrondissement. Thank you Jean-Michel Nomdedeu for answering our questions!